year. Buyers’ demand remains strong, and median sales prices tops levels last seen in 2007. Sellers like the September market conditions, and push listings up 16.5% over this time last year, slowing the steep decline in inventory. That’s the 6th month in a row we’ve seen double- digit increases in new listings. DC metro market sales are up 12.1%: That’s the 6th month in a row of double-digit growth, and this run outranks every September for the last 4 years. Condos continue to attract first-time buyers and investors and dominate the market. Condos capture 41% of the increase in all sales across the region, and top the charts with a sales increase of 19.2% over last September. Townhomes show 7 months of consecutive double-digit growth, with sales up 10.2% from this time last year. Detached homes follow with a sales increase of 9.6%. 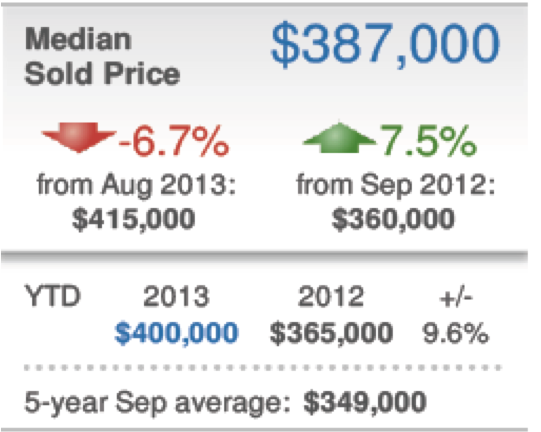 Across the entire region year-to-date, the median sales price rose 9.6% compared to 2012. 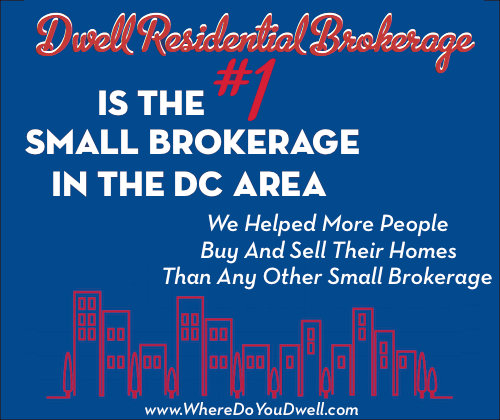 Says Jonathan Hill, President of Real Estate Business Intelligence, “Strong demand has driven overall home prices up significantly over the past five years in the region.” In DC, prices jumped by $27,000 for a median sales price of $387,000. That’s a 7.5% increase over last September and the highest level since 2007. Detached homes had the biggest increase, at $43,747, or 10%. Townhomes jumped $23,750 or 6.6%, and condos showed the smallest gain of $14,900, or 5.5%. But, prices are slightly down from last month by about 6.7%. That is likely due to the increase in inventory. As a flurry of sellers enters a favorable market, the drop in inventory slows down. Why? Sellers are putting their homes on the market faster than contracts are being signed. Inventory has its highest number of listings in September since 2010. 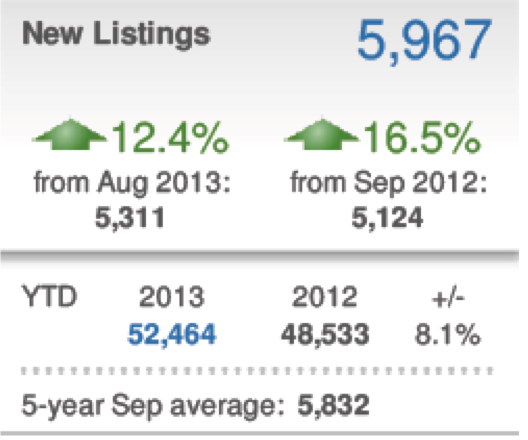 New listings increased 16.5% compared to this time last year; That’s also 6 months in a row of double-digit growth. Condos claimed the number one spot with a jump of 26.5% from last September. Townhomes followed with an 18.6% increase in new listings and single-family homes came in with 10.5%. Of course, it doesn’t hurt that median days-on-market (DOM) is at an 8-year historic low, just 17 days!